The U.S. and China are edging ever closer to a full-blown trade war, but it won’t just be the two superpowers affected. With its equity markets highly correlated to global growth, many view Japan as a potential casualty of the ongoing war. However, Dan Carter, Fund Manager on Jupiter’s Global Strategy argues that while Japan will no doubt be affected, the factors that make Japan an investment opportunity are largely disconnected to the actions of Trump and Xi Jinping. Perhaps the most pressing issue facing global markets for the remainder of 2018 is to what extent a self-inflicted trade reversal might affect equities. The spotlight has so far focused on the two biggest economies in the world, China and the U.S. However, nowhere is that question more pertinent than in third place Japan, which finds itself watching from the side-lines as its two biggest trading partners fight over trade. The good news for the country is that, despite criticism from Trump, the tariffs that affect Japan are focused solely upon steel and aluminium. Whilst Japan does export some metals to the US, these are dwarfed by other manufactured products such as machinery and autos, which, for the time being, seem to have escaped Trump’s crosshairs. The risk of higher trade barriers to the auto sector cannot be written off. Nevertheless, the fact that Japan doesn’t charge tariffs for non-Japanese companies to access its own auto market means it is hardly provoking higher trade barriers in its destination markets. Whilst the specifics of the current situation are somewhat reassuring, we are aware that the more general concern of an overall trade roll-back is perhaps more significant. 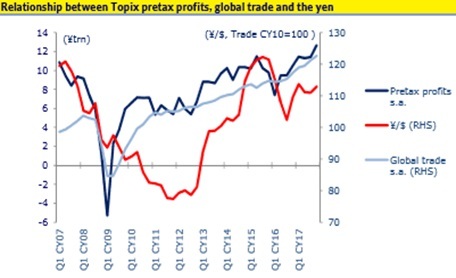 The chart below illuminates two simple but important facts – that the global economic and market recovery since 2009 has been associated with growth in global trade (likely as both a cause and effect) and that global trade volumes are highly correlated with the total profits of listed Japanese companies. Clearly global growth is linked to Japan’s own prospects and considering that the IMF has recently warned in its World Economic Outlook that the ongoing threat of a trade war could significantly impact the upswing in global growth, an escalating trade war could be harmful to Japan. A fact not overlooked by the Japanese government, which has avoided counter-tariffs of its own and in fact entered in to dialogue with China for the first time in eight years - in part an effort to protect itself against recent protectionism. However, while Japanese equities are linked to global growth, as bottom-up investors we try to avoid the noise and instead focus on a number of exciting themes in Japan that shouldn’t be impacted by a trade war. For example, when exploring opportunities in the region demographics play a very important role. Japan has an ageing population where deaths now outnumber births at an average rate of 1,000 a day. This creates increasing demand for services such as cheap, modern healthcare which is being met by companies such as microbiological investigations firm EIKEN. These firms are capitalising on apparently negative demographic trends, trends which will exist in Japan regardless of the global trade dynamic. Another such trend largely unaffected by trade is Japan’s focus on improving corporate governance. Historically, Japan has had poor governance in comparison to other major, developed economies. However, the Government has made improvement a priority which in turn has made it an opportunity. From our perspective, there are a number of companies which we consider ‘coiled springs’. We believe these coiled springs will be uncoiled by better governance, better capital management and board independence – which will release value in a relatively short space of time. With the above in mind, the current trade-war narrative is not a major concern for us. Of course should the trade war continue to escalate, the Japanese sector would undoubtedly feel some pain. But a meaningful reversal in global trade seems unlikely and we believe there are exciting trends in Japan isolated from the global trade rhetoric. Ultimately the coming months could throw up some surprises but the win-win nature of trade means that all parties are incentivised to tread carefully and this is our base case expectation. As things stand, Japan is not excessively impacted by the ongoing tariffs, and if investors look in the right places, opportunities exist in Japan whichever way the war swings.